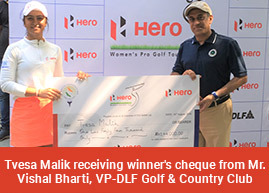 Pune, February 16: Gurgaon’s 21-year-old Tvesa Malik turned in the best card of the week to run away a comfortable winner in the fourth leg of the Hero’s Women’s Pro Golf Tour on Friday. Tvesa, who turned pro last year and won twice in eight starts, shot two-under 70 to finish at six-over 222 and win by four shots over Suchitra Ramesh (74). Suchitra Ramesh, who had back-to-back birdies on fourth and fifth, dropped a bogey on sixth and a double on eighth to turn in one-over. On the back nine, she birdied 14th but dropped a shot on 18th, at which time she had no chance of catching up with Tvesa. Saaniya had a run of three bogeys from fourth to sixth which jeopardised her title hopes and she had three more bogeys on back nine. She had just one birdie on either side of the turn in her 76. Neha birdied first and ninth and dropped a shot on sixth and was the only player to play the front nine in under par. She was leading at that stage. A quadruple bogey on 10th ruined her chances and she was unable to recover from that disaster. She failed to find any birdies after that and also dropped shots on 14th and 18th to slip to fourth. Gursimar Badwal (73) salvaged the week with a solid final round and leaped to Tied-5th alongside Smriti Mehra (78). Ayesha Kapur (74) and Siddhi Kapoor (75) were Tied-7th, while Millie Saroha (81) was ninth and Trisha Sunil (74) was tenth. The first round co-leader Tavleen Batra fell further with a second successive 85 and ended 16th. As Tvesa moved to the top of the Hero Order of Merit with Rs. 3,72,000 from four starts, Gursimar Badwal (Rs. 3,29,300) was second and Neha Tripathi was third with Rs. 3,16,400.